In a series of States of the Twitosphere for different European countries, this is the third edition, showing the State of the Italian Twitosphere. In the first edition, the Belgian Twitosphere was analysed. In the second edition, the Dutch Twitosphere was the topic of discussion. The analysis of the Italian Twitosphere is based on 706 active Twitter accounts from Italy. A Twitter account was considered to be held by someone from Italy if the location explicitely refers to Italy or if the Twitter user was located in Italy according to one of the Twitter mapping mashups (see this previous post). The actual number of Italian Twitter users is probably a lot higher. I would not be surprised if the actual number is over 1000. Only a lit bit more than half of the Twitter users specify their location in their profile (see this previous post). Furthermore private Twitter accounts or public Twitter accounts with no or only a few friends are very difficult to locate. 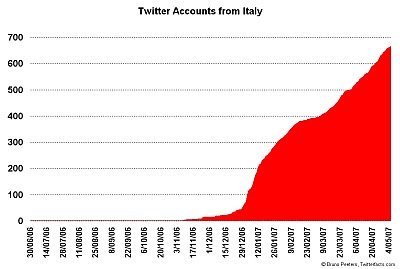 This first graph shows the history of the Italian Twitter accounts. The graph is based on the date of the first message posted on each of the public Italian Twitter accounts. 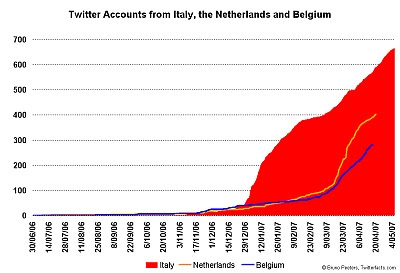 The second graph compares the history of the Twitter accounts from Italy, the Netherlands and Belgium. It becomes clear the Twitter hype started much earlier in Italy, already in January 2007. From mid February 2007 to March 2007, the increase of Twitter accounts slowed down, accelerating again from mid March 2007. The Twitter hype in the Netherlands and in Belgium acceralerated strongly only from mid March 2007. It is strange that no Twitter accounts were found that were created between June 30, 2006 and November 1, 2006. 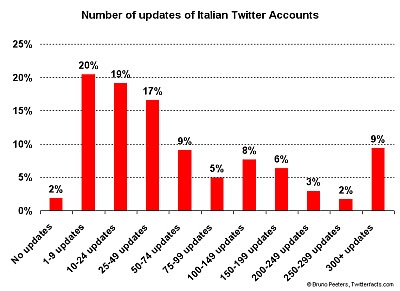 Only 25 Twitter acounts from Italy or 3,5% have chosen the keep their updates only available to their friends. According to the First State of the Belgian Twitosphere 22% of the Belgian Twitter accounts are private, according to the First State of the Dutch Twitosphere 9,5% of the Dutch Twitter accounts are private. This can indicate that Italian private Twitter account are perhaps partly missing from this analysis. 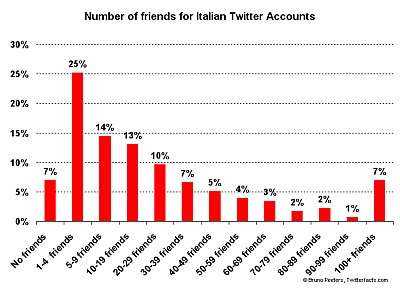 7% of the Italian Twitter accounts have no Twitter friends at all. An average Twitter account from Italy has 32 friends, which is a lot higher than the 9,6 friends for a Belgian Twitter account and 13,5 friends for a Dutch Twitter account (these averages were calculated several weeks ago). A follower is someone who has indicated another Twitter account as friend and receives all updates of that other Twitter account. 4% of the accounts have no Twitter followers at all, meaning that no one else on Twitter has indicated this account as a friend. An average Twitter account from Italy has 26 followers. For a Belgian Twitter account there were 10,5 followers, for a Dutch Twitter account there were 12,5 followers. Only 2% of the accounts from Italy are still waiting for their first update to be published. Currently an average Twitter account from Italy has 106 updates, compared to 72 for a Belgian Twitter account and 88 for a Dutch Twitter account. Please keep in mind that these averages are only snapshots, as lots of new Twitter messages (or Tweets) are published every day. The averages for Belgium and the Netherlands were calculated a few weeks ago. 33% of all Twitter accounts from Italy with a public feed did not post an update in the last 20 days. They can perhaps be considered as inactive accounts. For the Netherlands this was 10% and for Belgium 12%. 57% of all Twitter accounts from Italy with a public feed did post at least one message in the last 7 days, indicating that these accounts are still alive. For the Netherlands this was 73% and for Belgium 74%. 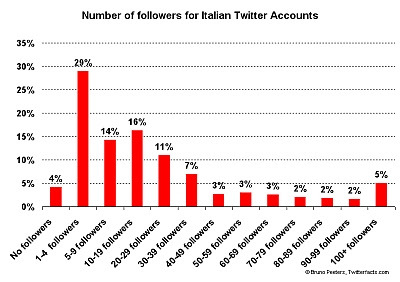 These figures indicate that the number of inactive Twitter accounts in Italy is higher than in the other two countries. Perhaps the hype about Twitter is partly over in Italy. This state of the Italian Twitosphere is only a snapshot, meaning that the figures mentioned in this post have already changed because the Twitosphere is a very dynamic environment with several new accounts being created every day, new connections being made between accounts (friends/followers) and of course new messages being written every hour of the day. The comparison of the Italian Twitosphere with the Dutch and Belgian Twitospheres reveals that the maturity of Italian Twitosphere is higher. Italian Twitterers have more friends and followers, they have written more messages. On the other hand the number of inactive Twitter accounts is also higher. The fact that 57% of the Italian Twitterers have at least one message in the last 7 days indicates that Twitter is still alive in Italy. Keep on twittering Italy. I would like to thank Tony Siino for his assistance in identifing Italian Twitter accounts. "It is strange that no Twitter accounts were found that were created between June 30, 2006 and November 1, 2006." It is not ... aron is not from Italy, but from San Francisco and probably has mistaken the country when he registered. My account was the first actually, in November, when I was used to call one of Twitter's developers in Germany as I wanted to use the SMS service too at the time, which was being tested in Europe. I think other web-site owners should take this website as a model – very clean and fantastic style and design, in addition to the content. You are an expert in this area! Will Twitter become a nightmare for companies ?